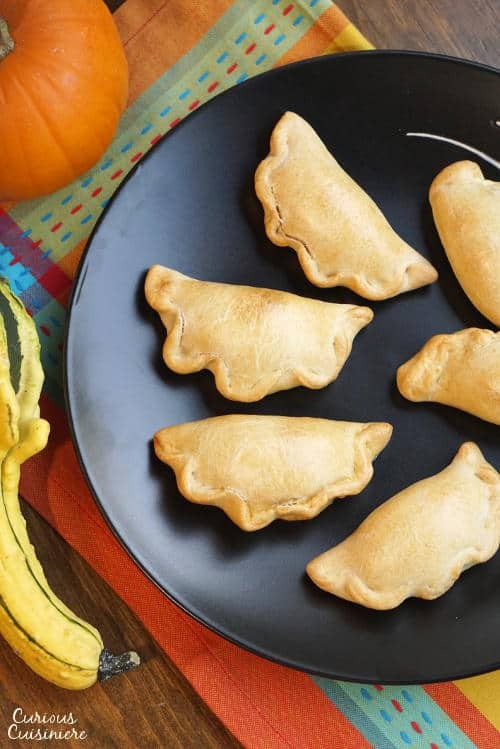 Lightly sweet and full of pumpkin pie flavor, these Baked Pumpkin Empanadas are a fun treat for any pumpkin lover! You’ve heard of empanadas, those tasty, Latin American pastries that are often stuffed with meat, cheese, or potatoes. The name empanada comes from the Spanish word empanar, meaning “to wrap or coat in bread”. Empanadas can be found throughout Latin America, and each country has their own unique take on the empanada dough, shape, and filling. 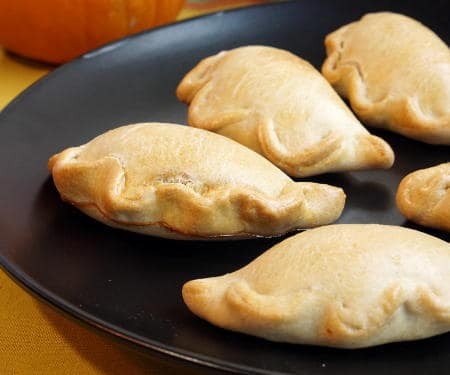 Pumpkin empanadas are often served at Mexican-American Thanksgiving celebrations as well as for their Christmas feast. 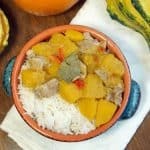 Traditional pumpkin empanads would be made with leftover pumpkin from a caramelized pumpkin dish, like Calabaza En Tacha. 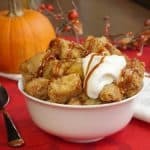 The sweet, caramelized pumpkin that has been stewed with warm spices is transformed into a heavenly pocked of pumpkin goodness that is encased in a hearty and crisp empanada dough. 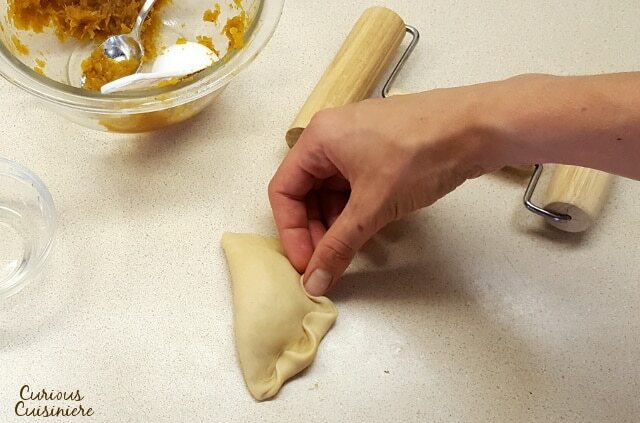 Sealing the empanadas can be as simple or complicated as you want to make it. In fact, for some, sealing empanadas has become an art form! The fun, decorative sealed edges that some people go all out with are called repulgue. 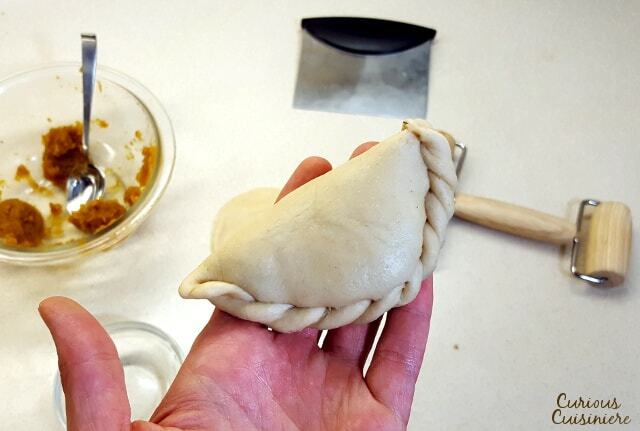 After watching a couple videos on one of the most common ways to repulgue an empanada, we tried our hands at it. It took a few tries, but we finally got it! Check out the video below for our tutorial on how to do the traditional repulgue. If your fingers find the pulling and wrapping technique a bit tricky. Don’t worry! We crimped the edges two ways, the traditional way we did in the video and a more simple way that was inspired by the way we typically do the edges on our pies. You can see this way in the picture below. If neither of those options are working out the way you are hoping, simply grab a fork and give the edges a little crimp. Or, just press them down well and forget about the pretty decorations. They’ll still taste just as good! 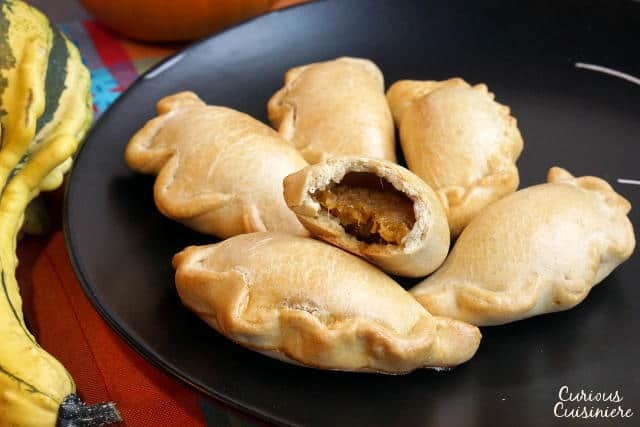 Like we mentioned, traditional pumpkin empanadas bring together some wonderful, traditional dishes of pumpkin stewed with piloncillo, a deep-flavored sweetener that is made from unrefined cane sugar. We’ve simplified our empanada filling by using pureed pumpkin (not pumpkin pie filling), brown sugar, and spices. 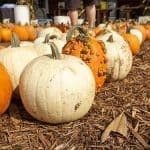 These won’t be as sweet as a slice of pumpkin pie, and the crust definitely isn’t as flaky as a pastry crust. 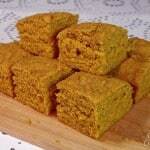 Our version is light on the sweetness, but heavy on the pumpkin spice flavor. The filling is wrapped in a crust that is more bread-like, giving you something that is quite satisfying to sink your teeth into. We’ve also chosen to bake our empanadas, to make cooking easier and to make them a bit lighter. 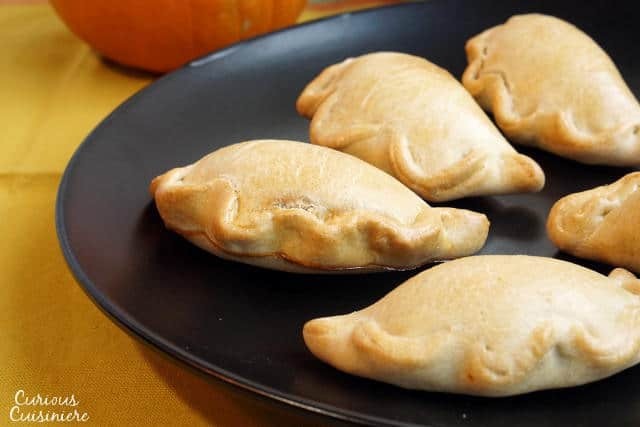 With their light sweetness, hearty dough, and baked-crisp texture, these pumpkin empanadas could almost be called a healthy way to get your pumpkin pie fix! For best results, let the dough rest for 1 hour between making the dough and shaping the empanadas. Place the flour and salt in the bowl of your food processor. Add the butter cubes and pulse until combined. Add the egg and pulse until combined. Add the ice cold water, a little at a time, pulsing between additions, until a coarse dough begins to form. Transfer the dough onto the counter and knead it until a smooth ball of dough comes together, 2-4 minutes. Wrap the dough in plastic wrap and refrigerate it for at least 1 hour (not over 24 hours) to relax the gluten. In a medium bowl, add all of the filling ingredients. Mix until combined. Taste and adjust the sweetness or seasoning as desired. Cover and set aside until you are ready to put the empanadas together. Roll each ball of dough out to a 4 inch disc. 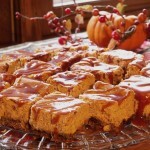 Fill the circle of dough with 1 Tbsp of pumpkin filling. Wet your finger with a little water and use it to moisten the edge of the dough around the filling. Fold the circle of dough in half over the filling, to create a filled half-circle. Press the edges together firmly to seal. If desired, crimp (repulgue) the edges by twisting and folding the sealed edge over itself (see the video above). Or, crimp the edges as you would any pie crust. Place the sealed and crimped empanadas onto a greased, aluminum foil lined baking sheet. Brush the tops of the empanadas with an egg wash made from 1 egg white beaten with 1 Tbsp water. If desired, sprinkle some cinnamon sugar over top of the empanadas. Bake the empanadas for 20 minutes, or until golden. Removed the baked empanadas from the oven and let them cool slightly on a wire rack before serving. 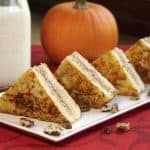 Why cant you use pumpkin pie filling? 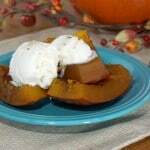 Canned pumpkin pie filling already contains sweeteners and seasonings. 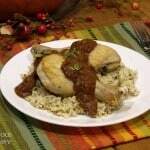 Our recipe has you add these things to a taste that accentuates the empanadas.